General Hospital spoilers share the exciting news that 54-year-old ex-Blackie Parrish actor John Stamos welcomed his first child over the weekend. He proudly announced the birth of a son born to him and model wife, Caitlin McHugh. Their adorable bundle of joy – a perfectly healthy, little boy – is named Billy Stamos after John’s father! 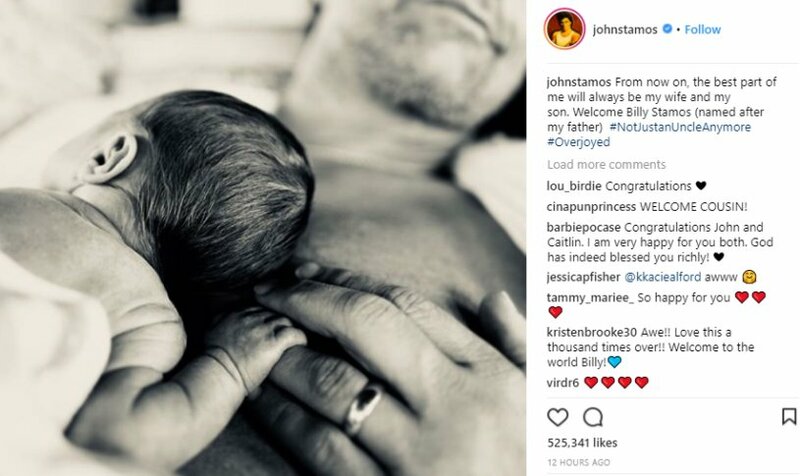 John Stamos posted on his Instagram account with some of the most precious photos of his newborn son, who was honored to carry on John’s father’s name. News from OK Magazine shared more photos from John and his wife. Also, Stamos shared with his fans on Instagram some other precious moments leading up to the best experience of his life – something John doubted would ever happen. The GH alum shares his more private life with Caitlin, a wedding photo, and their lives with their precious dogs. But if fans recall, Stamos had pretty much given up hope of ever becoming a father and seemed to accept that he would have the status of “Uncle” forever. We have to wonder, who was more excited when People magazine announced that John and Caitlin revealed in December they were expecting. “Have Mercy!” was an understatement! For newer General Hospital fans, you might not know that John Stamos was on the ABC soap opera from 1982-1984. He played street kid Blackie Parrish who became the foster son of Lesley Webber (Denise Alexander) and Dr. Rick Webber (Chris Robinson), but quickly got mixed up in the music industry. Blackie’s desperate need for fame caused him to do dangerous things to make his group “Blackie & the Riff Raff” a huge success. He even stole a song from a hotel bellhop. Unfortunately, when Blackie was caught, a fight sparked and Lou Swensen, the original songwriter, hit her head and died. That ended Blackie’s music career and life as he knew it when he was sent to prison for manslaughter. 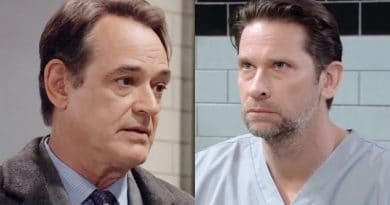 General Hospital spoilers tease that Blackie later got out of prison as Lucy Coe name dropped Blackie at the Nurse’s Ball three years ago. So, one has to wonder, will we ever see Blackie grace our TV screens again? The staff here at Soap Dirt would like to offer both John Stamos and Caitlin McHugh a heartfelt congratulations on the birth of their beautiful and healthy son, Billy. We look forward to hearing many, many more stories about your family and exciting adventures that lie ahead. Watch GH daily for new episodes and check Soap Dirt often for more General Hospital spoilers and news. ← ‘Bold And The Beautiful’ Weekly Spoilers April 16-20: Liam Chooses Hope – Taylor Shoots Again!